Want to export PowerPoint to video? Use Movavi PowerPoint to Video Converter! This tutorial is about creating videos from PowerPoint presentations. If you want to create a video presentation from photos and pictures, check out our tutorial about creating slideshows. 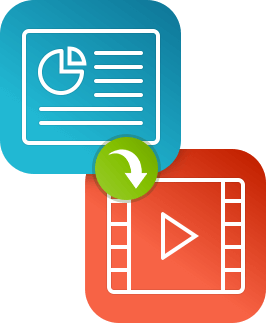 If you want to make a video presentation of an application, site, or web service, check out our tutorial about creating video guides. PowerPoint is still a popular tool to add a graphical element to speeches, business projects, and thesis presentations. But the PPT format requires that the viewer has a Windows PC with PowerPoint installed, which is not always convenient. And if you do not have access to a PC with PowerPoint, things can get pretty complicated. Movavi offers an easy solution to this problem – a tiny app that turns PowerPoint slides into video animations. Simply add your PPT file to the software and make a film out of it in a widely used multimedia format to prepare the PowerPoint video: AVI, MKV, WMV, and MP4 for PCs and mobile devices; 3GP for viewing on a cell phone; MOV for Mac computers; FLV, WebM, and OGV for uploading to YouTube and other websites; or MPEG for burning to DVD. 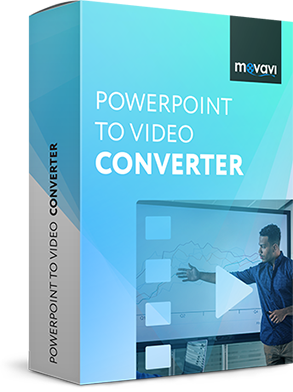 Download Movavi PowerPoint to Video Converter to create a video presentation from a PPT yourself. Making a video presentation is easier than you think – just follow the simple instructions below! Open the downloaded EXE file. You will see the Installation Wizard with its familiar instructions. Follow them to complete the installation process. Click Browse near the Presentation file field and locate the PPT file you want to transform. Change the Destination folder below if you want to export the output video to a different location. 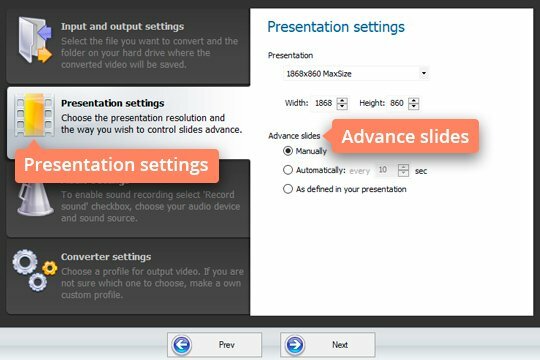 In the Presentation settings tab, you can choose the resolution of the output video file, as well as the mode and the speed of slide transitions in the Advance slides menu below. You can configure the settings manually, specify an automatic transition every few seconds, or keep the original timing set in the PowerPoint file itself. The Movavi program enables you using a soundtrack in your presentation video. 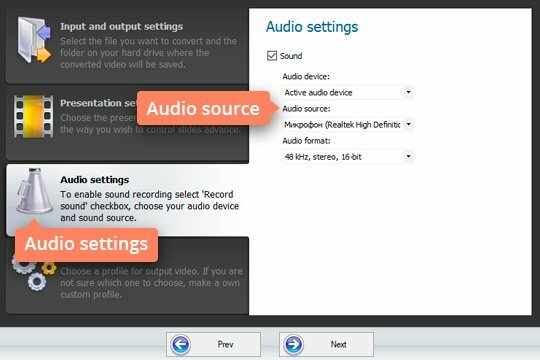 Switch to the Audio settings tab and choose the Audio source that you want to use. 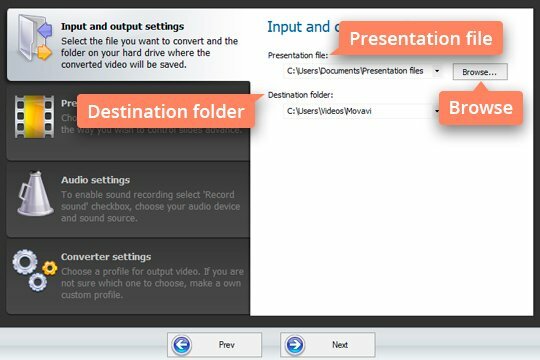 If you choose your computer’s speakers, the program will capture the sounds that play on your PC while recording the PowerPoint file to video. If you choose the microphone, you can record your own voice giving a commentary to the presentation. In the lower Converter settings tab, select your preferred video format. If you plan to watch the output video on a mobile device, click More presets for devices and select your device’s brand and model from the list. When everything is set, click Convert! below to record your PowerPoint presentation as a video. Note that the conversion is done slide by slide in real time, so the presentation should be played from the beginning to the end to retain the logic and sequencing of the original. The ultimate tool to turn your PPTs into video clips.